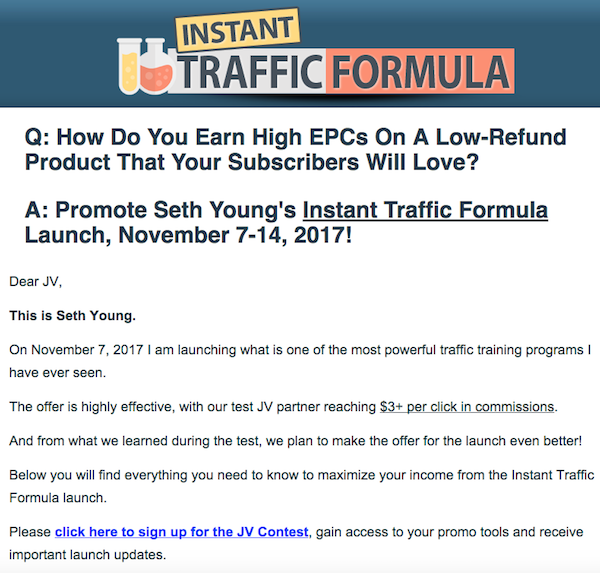 Welcome to the JVNP 2.0 Update featuring special JV related content from fellow JVNP VIP Partner Seth Young (Instant Traffic Formula traffic course launch affiliate program JV invite), Buzz Builders (Minesh Bhindi – Gold And Silver For Life October-Fest 2017 launch), and More … in Today’s proven traffic system profits edition. Get ready for HIGH EPCs with the launch of Instant Traffic Formula, a unique traffic course which your subscribers are really going to like. After many months of development and two testing periods with over 100 paying students, I am finally ready to launch this proven product and sales funnel to the general public. Instant Traffic Formula is incredibly powerful, but also simple and easy to implement … FAST! How fast? I tested the system out with my assistant — a complete newbie. She started driving traffic almost immediately and at the end of 2 months of part-time work she was able to send over 19,000 targeted visitors to one single blog post — which only took about 10 minutes to create! Click here to see the full JV page, or keep reading for more info. The course has step-by-step videos showing exactly how to implement the traffic system and drive tons of new visitors to your site. Plus there are a number of video lessons showing how to set up a free blog and/or a simple but professional-looking web site, and how to stock them with awesome free content. This system is something that just about everyone can — and should — implement to create or build their online business. In addition to the course there is a $197 upsell — 52 live, weekly coaching sessions to help people better implement what they have learned. The upsell will drive up your EPCs and lower refund rates. 1) A solid product that really works — you will be proud to promote it and your subscribers will happy you sent them. 2) 50% commissions across the funnel. 3) Total pre-launch and launch prizes worth a total of $3,000. 4) Useful, free content (no opt-in required!) during the pre-launch to generate buzz and pre-sell your subscribers. As I mentioned above, there were already 2 test periods where we tested the sales pages, pricing, and the course itself. Everything is working well, with good EPCs and low refund rates. We are ready to roll! Sounds good? See the full JV page & mark down November 7 on your calendar. Aidan Booth & Steve Clayton, Simon Hodgkinson + Jeremy Gislason, MindValley, Anik Singal and other fellow JVNotifyPro 2.0 partners are waiting in the wings … keep your eyes on your Inbox, and follow the action in the JVNP 2.0 Premium VIP JV Announcement archives.